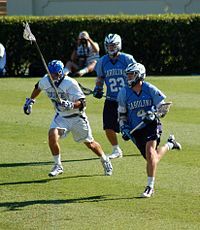 College lacrosse is played by student-athletes at colleges and universities in the United States and Canada. In both countries, men's field lacrosse and women's lacrosse are played at both the varsity and club levels. College lacrosse in Canada is sponsored by the Canadian University Field Lacrosse Association (CUFLA) and Maritime University Field Lacrosse League (MUFLL), while in the United States, varsity men's and women's lacrosse is governed by the National Collegiate Athletic Association (NCAA), National Junior College Athletic Association (NJCAA) and National Association of Intercolliegiate Athletics (NAIA). There are also university lacrosse programs in the United Kingdom sponsored by British Universities and Colleges Sport (BUCS) and programs in Japan. In the U.S., as of the 2016–17 academic year, there were 71 NCAA-sanctioned Division I men's lacrosse teams, 61 Division II men's lacrosse teams and 236 Division III men's lacrosse teams. There are 112 Division I women's lacrosse teams, 105 Division II women's lacrosse teams, and 282 Division III women's lacrosse teams. There were also 27 men's programs and 16 women's programs at two-year community colleges organized by the National Junior College Athletic Association (NJCAA) and a growing number of National Association of Intercollegiate Athletics (NAIA) four-year small college programs. As of 2016–17, there were 184 collegiate men's club teams competing through the Men's Collegiate Lacrosse Association (MCLA), including most major universities in the United States without NCAA men's programs, organized into two divisions and ten conferences. Schools that feature a NCAA Division I FBS football team must play in Division 1, while most other teams compete in Division 2. There are 225 collegiate club teams for women organized by the Women's Collegiate Lacrosse Associates (WCLA). The first intercollegiate game in the United States was played on November 22, 1877 between New York University and Manhattan College. Lacrosse had been introduced in upstate New York in the 1860s. Lacrosse was further introduced to the Baltimore area in the 1890s. These two areas continue to be hotbeds of college lacrosse in the U.S. An organizing body for the sport, the U. S. National Amateur Lacrosse Association, was founded in 1879. The first intercollegiate lacrosse tournament was held in 1881, with Harvard beating Princeton, 3–0, in the championship game. New York University and Columbia University also participated. In 1882 three colleges formed a league called the Intercollegiate Lacrosse Association (ILA), which four other colleges soon joined. From this point through 1931, collegiate lacrosse associations chose an annual champion based on season records. In 1894, the Inter-University Lacrosse League (IULL) began play using slightly different rules. The two leagues merged in December 1905 to form the 8-team United States Intercollegiate Lacrosse League. The USILL was a closed-membership league, which excluded several lacrosse powers, such as the U.S. Naval Academy. The national championship was officially bestowed only upon teams that were included in the membership of these organizations. In 1912, the USILL established Northern and Southern Divisions and began conducting a post-season playoff. Harvard defeated Swarthmore, 7–3, in the first formal playoff. This system continued through 1925. As Navy was not a member of the USILL, its teams were not eligible for the championship, even though Navy had the best collegiate record in many of those years. Navy was undefeated from 1917 through 1923, a stretch of 40 games with one tie. The USILL was replaced by the United States Intercollegiate Lacrosse Association in March, 1926, as an open-membership governing body. Six more teams became new USILA members, in addition to the former USILL teams. The USILA bestowed gold medals upon the teams that it selected as national champions through the 1931 season. No official champions were named from 1932 through 1935. In 1936, an award was established in the memory of a Baltimore sportswriter to recognize annually the most outstanding teams. From 1936 through 1972, the USILA executive board awarded the Wingate Memorial Trophy to the national champions. From at least 1951, if not earlier, lacrosse divisions were officially named after legendary lacrosse-men. These were the Cy Miller, Laurie D. Cox, and Roy Taylor Divisions. They were more commonly referred to Division I, or A; Division II, or B; and Division III, or C. All college teams were placed in one of the three divisions, dependent upon their records, schedules, and success for the preceding five years, and a point system was created. Any team of the three divisions was eligible to win the national championship, but this was virtually impossible for non-Division I teams. A Division II team, playing several Division I teams, might have been able to achieve it. A team's record was required to include six games against teams in its own division. Teams were realigned every three years, again reflecting their records. All schools were eligible for the national rankings. The team that achieved the highest point total each year, however, was not guaranteed a solo national championship. The system served as guidance to the USILA executive board, who chose co-champions on frequent occasions. This point system prevailed with modifications until the NCAA in the early 1970s established the playoff system for determining champions. At its 1969 annual meeting in Baltimore, the United States Intercollegiate Lacrosse Association voted for its first playoff tournament to determine a national champion. In 1971, the NCAA began sponsoring men's lacrosse and began holding an annual championship tournament for Division I schools. The USILA conducted a small college tournament for non-Division I schools in 1972 and 1973. In 1974, the NCAA took over the sponsorship of this tournament through the 1979 season, with separate tournaments being conducted in both 1980 and 1981 for Divisions II and III teams. The Division II tournament then was discontinued until returning in 1993. In some circumstances, D-1 schools can offer several scholarships that cover up to 50% of tuition costs. As of 2018, the average awarded D-1 men's lacrosse scholarship is about $12,000 a year. The National Collegiate Athletic Association (NCAA) is the largest association and governing body of collegiate athletics in the United States. The NCAA holds lacrosse championships for all three Divisions in men's and women's lacrosse. Currently the NCAA has 368 men's lacrosse programs and 499 women's lacrosse programs. A map of NCAA Division I men's lacrosse teams. In the current 2019 NCAA lacrosse season, there are 73 NCAA Division I men's lacrosse teams, with 69 of them organized into 10 conferences, and four teams playing as independent D-I programs without a conference affiliation. These teams are heavily concentrated in the Northeast and Mid-Atlantic regions, and only four teams are not in the Eastern Time Zone. From 1936 through 1970 the United States Intercollegiate Lacrosse Association (USILA) selected the Wingate Memorial Trophy winners as national champions based on regular season records. Beginning in 1971, the National Collegiate Athletic Association began holding an annual championship tournament. The defending National Champions at the Division I level are the Yale Bulldogs. The most recent changes to men's lacrosse conferences occurred in the 2014 off-season. The Big Ten Conference sponsored the sport for the first time in 2015. The Big Ten move, along with other changes stemming from the early-2010s NCAA conference realignment, led to the demise of ECAC Lacrosse. The Southern Conference (SoCon) took over men's lacrosse sponsorship from the Atlantic Sun Conference (ASUN), which itself had only added the sport for the 2013–14 school year. This was a friendly takeover, as the two conferences had agreed in January 2014 to form a lacrosse alliance under which they would divide lacrosse sponsorship, with men's shifting to the SoCon and women's remaining with the ASUN. In September 2018 the NCAA rules committee implemented an 80-second shot clock that begins upon possession. A team must advance the ball across midfield within the first 20 seconds, and then 60 seconds to shoot the ball once across midfield. The clock will only reset if the ball hits the goalie or the post. Failure to score before the shot clock runs out results in a change of possession. Independents — Four schools, all relatively new varsity programs, are independents in the 2019 season. Cleveland State — Added lacrosse for the 2017 season. Hampton — Added lacrosse for the 2016 season. Hampton does not play a full varsity schedule yet, with all of their wins coming against D-III and junior college programs. NJIT — Added lacrosse for the 2015 season. Will join Northeast Conference men's lacrosse immediately after the 2019 season. Utah – Added lacrosse for the 2019 season. A map of NCAA Division II men's lacrosse teams. Division II men's lacrosse currently has the smallest number of teams compared to the Division I and Division III levels. Division II lacrosse is made up of 61 teams mainly located in the Northeast and Southeast. The USILA conducted a "small college" lacrosse championship tournament in 1972 and 1973. Division II men's lacrosse held its first NCAA tournament in 1974 with an eight-team bracket. The format remained the same until 1980, when the field dropped to just two teams as the Division III tournament was inaugurated. From 1982 through 1992, a Division II playoff was not conducted. In 2001, a four-team bracket was instituted. The Division II men’s lacrosse championship bracket expanded from four to eight teams starting with the 2013 season. Adelphi University currently holds the record for the number of D-II championships, with seven and also appeared in the championship a record 11 times. NCAA Division II lacrosse programs are organized into eight conferences, as well as independent programs consisting of mainly new D-II lacrosse teams. The newest addition to the roster of Division II men's lacrosse conferences came in 2017–18 when the Great Lakes Valley Conference began sponsoring men's lacrosse. On December 2, 2014; the University of Alabama In Huntsville (UAH) announced the additional of Men's and Women's Lacrosse programs. These programs began competition with the 2016 season, initially as independents. The defending National Champions at the Division II level are the Merrimack Warriors. A map of NCAA Division III men's lacrosse teams. The majority of schools playing NCAA men's lacrosse play in Division III, with 236 in all. Most Division III lacrosse teams are located in the Northeast, with only seven programs west of the Mississippi River. The USILA conducted a "small college" championship in 1972 and 1973. The NCAA Division III championship originally was combined with Division II from 1974–1979, before the NCAA split the non-Division I schools into separate Division II and III tournaments in 1980. Hobart has made a record 15 appearances in the championship game and won a total of 13 championships. Hobart lacrosse also won the championship the first 12 years it was held from 1980–1991. The 12 consecutive championships are an NCAA record but Hobart has not won again since 1993, and now plays at the Division I level. Salisbury University now follows closely with 12 non-consecutive championships and 17 appearances. NCAA Division III lacrosse programs are organized into 24 conferences and over 20 independent programs. The defending National Champions at the Division III level are the Wesleyan Cardinals. Women's college lacrosse differs significantly from men's lacrosse in terms of rules and equipment. The NCAA holds lacrosse championships for all three divisions and currently has 375 women's lacrosse programs. Women's collegiate lacrosse was originally governed by the U.S. Women's Lacrosse Association, which joined with the Association for Intercollegiate Athletics for Women (AIAW) to determine an annual champion. The USWLA and AIAW conducted championships from 1978–1982 before being usurped by the NCAA. The NCAA began sponsoring a Division III championship in 1985 and added a Division II championship in 2001. A map of NCAA Division I women's lacrosse teams. The NCAA began sponsoring a women's lacrosse championship in 1982. Lacrosse has grown into over 110 NCAA Division I women's lacrosse teams organized into 16 conferences. Only 13 programs are located outside the Eastern Time Zone—Northwestern, Vanderbilt, Denver, six Pac-12 Conference members, and four California schools outside the Pac-12. Of these 13 schools, only Denver also sponsors varsity men's lacrosse. The most recent change to the lineup of women's lacrosse conferences came during the 2018 offseason, when the American Athletic Conference added the sport effective with the 2019 season. The newest Division I women's lacrosse school is Kent State, which began varsity play in 2019 in the ASUN. Fellow Ohio school Akron will begin varsity play in the 2020 season, joining Kent State in the ASUN. The defending National Champions at the Division I level are the James Madison Dukes. Independents – No schools are independents in the 2019 season; the only school that played as such in the 2018 season, new varsity program East Carolina, joined its other sports in The American. There are 89 programs competing at the Division II level. Division II women's lacrosse is one of the newest championships sponsored by the NCAA. The first Division II women's lacrosse championship was held in 2001, when C.W. Post beat West Chester 13–9. Since then, the Division II level has been dominated, much like its men's counterpart, by Adelphi University. Through 2014, Adelphi women's lacrosse won six national championships. However, as of 2016, the national title belongs to Florida Southern College. The 89 NCAA Division II women's lacrosse programs are organized into nine conferences, as well as independent programs. The defending National Champions at the Division II level are the Le Moyne Dolphins. The NCAA Division III level is made up of 216 women's lacrosse teams. It is the largest women's lacrosse division and also the largest NCAA lacrosse division, surpassing the number of men's Division III teams by about 30 members. The defending National Champions at the Division III level are the Gettysburg Bullets. Map of varsity NAIA men's lacrosse teams. As of October, 2016, There are a 39 National Association of Intercollegiate Athletics (NAIA) schools that offer men’s and/or women’s varsity lacrosse, Lacrosse is an officially recognized sport by the NAIA. NAIA programs are currently in year two of NAIA invitational sport status. During this phase of recognition, teams compete to participate in a post season championship called the NAIA National Invitational. Each conference and A.I.I group receive one automatic qualifier with the remaining four bids going to the highest remaining teams from the NAIA national ranking. NAIA programs also regularly compete against NCAA DII and DIII teams. The Wolverine-Hoosier Athletic Conference (WHAC) announced on January 27, 2012, the addition of lacrosse for both men and women as conference sports effective the fall of 2012. The WHAC was the first conference in the NAIA to offer lacrosse as a conference championship sport. The Appalachian Athletics Conference and the Kansas Collegiate Athletic Conference recognized lacrosse as a conference sport in the Fall of 2015. The National Junior College Athletic Association (NJCAA) is the primary governing body of community college athletic programs in the USA and currently oversees 28 men's and 17 women's lacrosse programs predominately in the Northeastern United States. The NJCAA lacrosse programs do not compete in their regular conferences, but instead are ranked within their NJCAA Regions. The NJCAA has sponsored a men's lacrosse championship since 1970 and a women's lacrosse championship since 2004. There are also new lacrosse programs at community colleges that are not members of the NJCAA, such as the California Community College Athletic Association, which does not sponsor the sport at this time. The Men's Collegiate Lacrosse Association (MCLA), formerly known as the US Lacrosse Men’s Division of Intercollegiate Associates (USL MDIA), is a national organization of non-NCAA, college men's lacrosse programs. The MCLA was created by the MDIA Board of Directors and its creation was announced by US Lacrosse on August 24, 2006. The MCLA oversees play and conducts national championships for 184 non-NCAA men's lacrosse programs in 10 conferences and in two divisions throughout the country. The defending National Champions at the MCLA Division 1 Level are the Grand Canyon University Antelopes. The Division II National Champions are the Concordia-Irvine Eagles. The National College Lacrosse League (NCLL) is a men's lacrosse league comprising mostly Eastern US college lacrosse clubs (non-varsity). There are approximately 130 teams divided into 12 conferences. The programs are split into Division I and Division II. Many of the clubs are at schools that currently have varsity NCAA Men's lacrosse programs. The Women's Collegiate Lacrosse Associates (WCLA) is a collection of over 260 college club teams that compete under the US Lacrosse umbrella. Teams are organized into various leagues and two divisions. The association regulates different aspects of the teams, including minimum number of games played. A recent rule modification allows community colleges to become members. Teams that have been classified as either Division I or Division II have the opportunity to compete in a national championship each spring under US Lacrosse. ^ a b c d e f g h i j k l m n o p q r s Scott, Bob (1976). Lacrosse Technique and Tradition. The Johns Hopkins University Press. ISBN 0-8018-2060-X. ^ "Lacrosse History: The Birth of Modern North American Lacrosse 1850–1900". E-Lacrosse. Archived from the original on April 8, 2000. Retrieved May 30, 2009. ^ a b c "The History of Navy Lacrosse" (PDF). 2014 NAVY MEN’S LACROSSE MEDIA GUIDE: 84. Retrieved 2014-10-21. Coach Finlayson expanded the cornerstone of Navy’s winning lacrosse tradition with seven undefeated seasons from 1917 through 1923 (one tie), a 40 game winning streak. In that seven–year span, Navy stood supreme among college lacrosse teams in the nation. By the end of the 1926 season, Coach Finlayson had eleven undefeated seasons (including three with one tie), but had not yet won a national championship. In 1928, Navy shared its first national championship with Johns Hopkins, Maryland and Rutgers, followed by its second in 1929 when Navy and Union College were both presented gold medals. ^ a b c Clark, Charles B. "Letters". WASHINGTON COLLEGE Magazine. Washington College. Spring 1995. Retrieved 2014-10-20. ^ "Men's Division I Conference Standings". Inside Lacrosse. Archived from the original on 2011-04-10. Retrieved April 14, 2011. ^ "DI Men's Lacrosse Championship History". NCAA. Retrieved April 14, 2011. ^ "A-Sun Adds Men's Lacrosse for 2014" (Press release). Atlantic Sun Conference. February 11, 2013. Archived from the original on November 4, 2013. Retrieved April 1, 2013. ^ "SoCon, A-Sun Partner to Enhance Lacrosse" (Press release). Southern Conference. January 9, 2014. Retrieved March 31, 2014. ^ "Men's lacrosse adds 80-second shot clock for 2019". September 12, 2018. Retrieved December 14, 2018. ^ "NEC Welcomes NJIT as Men's Lacrosse Associate Member" (Press release). Northeast Conference. October 19, 2018. Retrieved October 23, 2018. ^ "DII men's lacrosse bracket to expand to eight teams". NCAA. Retrieved June 2, 2011. ^ "DII Men's Lacrosse Championship History". NCAA. Retrieved April 14, 2011. ^ "Men's Division II Conference Standings". Inside Lacrosse. Archived from the original on 2011-04-10. Retrieved April 14, 2011. ^ "UAH to Add Men's and Women's Lacrosse in 2016". UAH. Retrieved December 2, 2014. ^ "DIII Men's Lacrosse Championship History". NCAA. Retrieved April 14, 2011. ^ "Hobart To Move Back To Division III". LAX.com. April 26, 2008. Archived from the original on 2011-07-22. Retrieved April 14, 2011. ^ "Men's Division III Conference Standings". laxpower.com. Retrieved December 22, 2012. ^ "Women's Division I Conference Standings". Inside Lacrosse. Archived from the original on 2011-04-10. Retrieved April 14, 2011. ^ a b "DII Women's Lacrosse Championship History". NCAA. Retrieved April 14, 2011. ^ "Women's Division II Computer Rating". LaxPower.com. Retrieved April 14, 2011. ^ Smith, Jason (Dec 17, 2010). "OBU to add football, swimming, lacrosse". The Shawnee News-Star. Archived from the original on 2011-07-19. Retrieved April 14, 2011. ^ "WHAC Adds Two Conference Sports for 2012–13". WHAC. Retrieved 2012-01-28. ^ "NJCAA Women's Champions" (PDF). NJCAA. 2010. Archived from the original (PDF) on 2012-03-22. Retrieved April 14, 2011.